As our world becomes more and more interconnected, there has been a rise in strategies of how to leverage these interconnected capabilities. A marketing strategy which has been gaining traction within a variety of different industries is the unified customer profile - an unprecedented overview of the activity, history, characteristics and preferences of each and every customer. The unified athlete is a similar concept to the unified customer-- the athlete, irrespective of which sport he/she competes in, has a multitude of data silos attached to their name that cannot talk to each other. The unified customer profile comes from the need for a business to track that customer throughout their interactions in order to engage with them effectively in the future. Whereas, the need for a unified athlete profile allows the athlete to have complete control of all their own data, from contract signing, and bonus payments to medical records and wearable data. Athletes have their information collected in an array of disparate siloed databases, the majority of which the athletes themselves don’t know where they’re located. This is the problem. The collection of biometric data is on the rise. Leagues are introducing the collection of movement data during gameplay. Teams, coaches, and medical professionals want to have more and more information on their athletes so they can further analyze that athlete’s performance, improvement, recovery etc. Enter: wearables. Wearables are smart electronic devices, which provide various live stats on an athlete’s biometric, positional or physical data. There are three parties involved in the current method of wearable data collection: the athlete, the party requesting the data (usually the athlete’s team) and the company who makes the wearable. The most common scenario is that the wearables company owns the data collected by their device and subsequently provides access to that data to parties who request it, often the athlete’s coach or medical professionals, and the athlete may never even see the data. When looking at this entire athlete data debate, there is one clear solution - blockchain. The basis of blockchain is that viewership and changes made to data is strictly monitored and visible for all access-granted parties to see. To read about a more detailed version of blockchain basics, read STG’s Top 5 Blockchain Must Knows here. The Unified Athlete Profile, allows all of an athlete’s biometric, movement, and tactical data to be kept in a database owned by that athlete. That athlete would then be able to share access to their database through permissioned sharing settings, and revoking access to that database as the athlete pleases. This would also negate the issue of what happens to an athlete’s data and how its ownership is transferred when an athlete is traded. The implementation of blockchain technology to create a Unified Athlete Profile would go far beyond the scope of just training data collation. 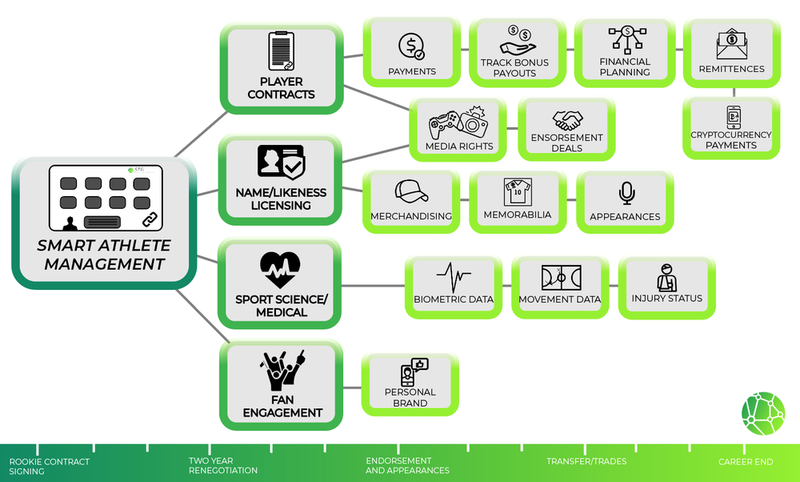 Blockchain could be used to create a Unified Athlete Profile wherein player contracts, name/likeness licensing, sports science/medical information, and fan engagement data could be pooled for the athlete, agent, team or league to manage/view in one location. Athlete Contracts - on the blockchain would allow athletes to be paid both their salary and their bonus payments automatically through smart contracts. Paid on a monthly basis? Salary gets transferred directly into the athlete’s account at 12:01 am on the 1st of every month. 8-goal bonus? The moment the athlete scores that the eighth goal, the bonus is transferred directly to their account. 25% remittance to the athlete’s family in Brazil? 25% of each payment is rerouted directly to the family’s account. Name & Likeness Licensing - on the blockchain would directly reroute the agreed upon % of sales to the athlete’s themselves. The athlete would then receive their entitled profit from third-party companies benefitting from selling merchandise, memorabilia etc. with that athlete’s name on it. All contracts can also be managed with the help of an agent here as well. The athlete will know where their images are being used and what it can mean for their personal, or team brand. Sport Science & Medical - data on the blockchain, as discussed previously, would allow the athlete to be in complete control of their own data and who gets permission to view it, when and for how long they are given access to view it. This data will travel easily with the athlete from team to team when they are traded. Fan Engagement - on the blockchain would allow the athlete to leverage their own personal brand and engage with his/her fans in a secure fashion. With AI functionality built in they can track their analytics and maximize their exposure. Therefore tying back into sponsorship and providing more leverage in the negotiation process. See the image below for a detailed overview of how STG’s solution would create a Unified Athlete Profile on the blockchain. The Unified Athlete Profile is a concept that STG believes will come to fruition in the near future as the need for secure and transparent interactions becomes expected and demanded. Young athletes are joining the ranks of professional sports teams each year, and becoming increasingly empowered and reliant on technology. By embracing new technology and unifying athlete profiles sports teams and franchises can future-proof their organizations an increasingly skeptical world.. Check out what STG has planned to further the development of the Unified Athlete Profile, and follow us on our social channel to keep up with all things #SportsTech.